Land Sharks: Myth or Terrifyingly Real Awesomeness? Any chance on running into such an elegant creature on the coastline? 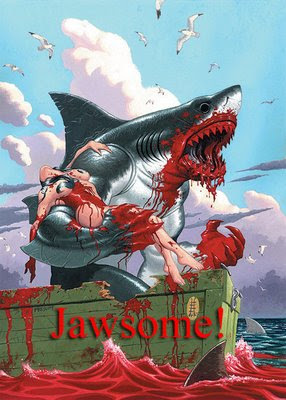 Re: Land Sharks: Myth or Terrifyingly Real Awesomeness? This was a tough one for us. While it is only natural to want to include the glorious Land Shark in the game, we weren't sure we could fully do it justice in this environment. How do you balance for something so dominant? It's basically a "game over" button. It was agreed that if we could bring ourselves to add a land shark, it would certainly be pantsless. "DONT GO IN THERE! ITS A LAND SHARK! YOU WIIIIIIILLL DIE!" written on the door of its hideout/whatever ... in blood... a lot of blood... problem solved. DarkTwinkie wrote: How do you balance for something so dominant? You may need a bigger boat however! If I can give him a pipe and a gimpy leg, you have my vote. Give the land shark the pipe! It has to be a Dr. Evil landshark mech-lazer shooting monstrosity. If its going to be pulp fiction goodness go all out, have one or two tentacles to get land-shark-topus. If you've gone land shark you've got to go land sharktopus. If you've jumped the land-sharktopus, you might as well put a bear paw on one of the tentacles so you get full blown bear-land-sharktopus. Needless to say this slippery slope is all debauchery and just calls for shark to be guarding vats of high quality beer. Make it a boss. The final boss. Carefull: falling into said VATs would turn you into some sort of psionic cyborg creature, bent on turning everybody into super beer enhanced shark/human mutant to save everbody from themselves.